The big case on the Tissot Chrono XL Tour de France Special Edition, which has a diameter of 45mm, means this watch really is larger than life. Enabling cyclists and fans of the sport alike to wear a piece of the lifestyle on their wrist, it celebrates everything that is great about the cycling life. The cool street feel of the watch tells of health, fresh air and independence, while its large dial and contemporary Arabic numerals at 12, 3, 6 and 9 o’clock means the time is easily readable too. The handy chronograph function only adds to its urban style. The Tissot Chrono XL collection comes in many styles, but this special edition is one of the most exceptional yet. It combines sophisticated details, including a smooth matte steel case and leather strap, with vibrant pops of colour. 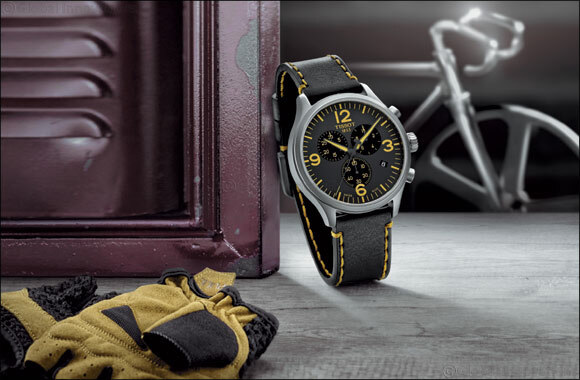 Touches of yellow on the hands, around the dial and on the stitches of the bracelet will give the wearer a jolt of adrenalin, much like the cyclist himself experiences as he reaches the finish line. The vivid yellow hue recalls the Yellow Jerseys of the cyclists, while a caseback engraved with the Official Tour de France logo will make this a fitting gift for fans of the iconic race.